Jeep isn’t just a brand. It’s an image in the consumer’s head. They hear the word Jeep and they think off-roading, muddin’ and adventure. But, Jeep does make more than just trail-ready off roader. Although my tester this week is certainly able to get dirty and head off the beaten path. The 2017 Jeep Grand Cherokee is a versatile SUV that is well adjusted on the road and off the road – after all it is a Jeep. And for sure, the Grand Cherokee earns the Jeep name and wont’ disappoint with its rugged ability. But, most consumers will buy the Grand Cherokee as a daily driver and family hauler. And as that it doesn’t disappoint either. For 2017 there’s a new Trail hawk trim (which is even more rugged and trail ready as the name insinuates). My tester was the Summit trim, with 4-wheel drive and a V6 engine with an eight-speed transmission. 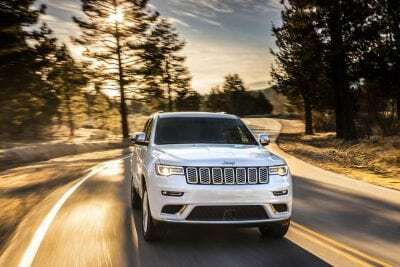 There are three engine options for the Grand Cherokee including the aforementioned 3.6-liter V6, along with a turbocharged 3.0-liter and a super powerful 5.8-liter V8. Consider that the old-school option with the turbocharged one being new school. My tester was the standard option, and the one most consumers will turn to. The 3.6-liter makes ample power at 300 horsepower. 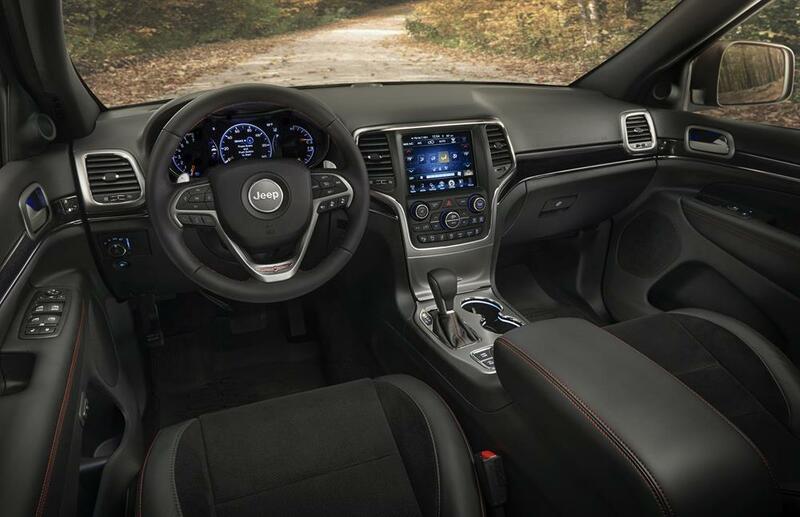 The 8-speed transmission is FCA’s best transmission offering with seamless shifts. This transmission works well keeping the power controlled, but not holding any back either. Would be interesting to see how it compares to the turbo engine which is a little quicker. As such, the performance is ideal for an SUV of this size. 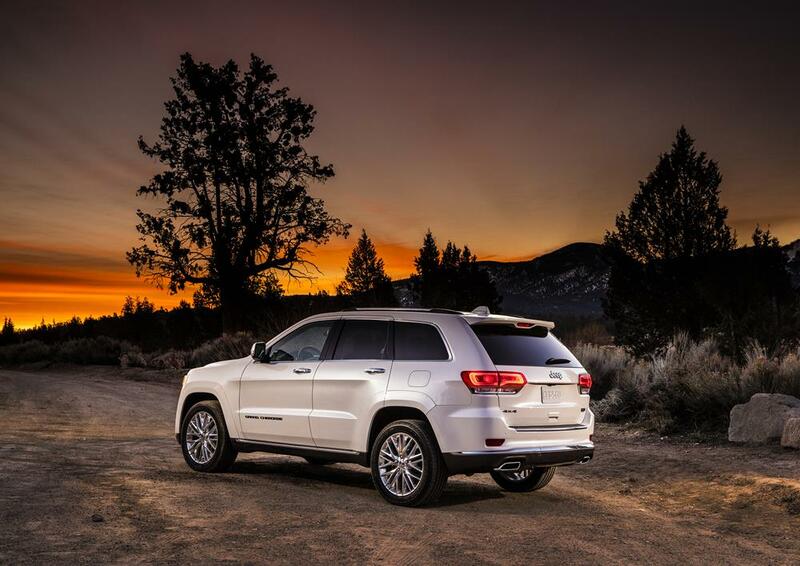 The Grand Cherokee offers full time four-wheel drive and terrain select mode, making it off-road ready. The adjustable air suspension helps with both on-road smoothness and off-road ruggedness. The new Trailhawk trim is the most rugged with a hill descent feature and electronic slip differential. The Grand Cherokee has a towing capacity ranging from 3,500 pounds to 7,400 pounds depending on the engine and what is offered. On looks, little has changed from the previous model year. It has that classic waterfall-esque grille that is synonymous with Jeep. The Summit trim, which is what I tested, gets some slight aesthetic embellishments. All told, the Grand Cherokee is a handsome SUV that is distinctive on the road. In a crowded SUV field, it will stand out on looks. 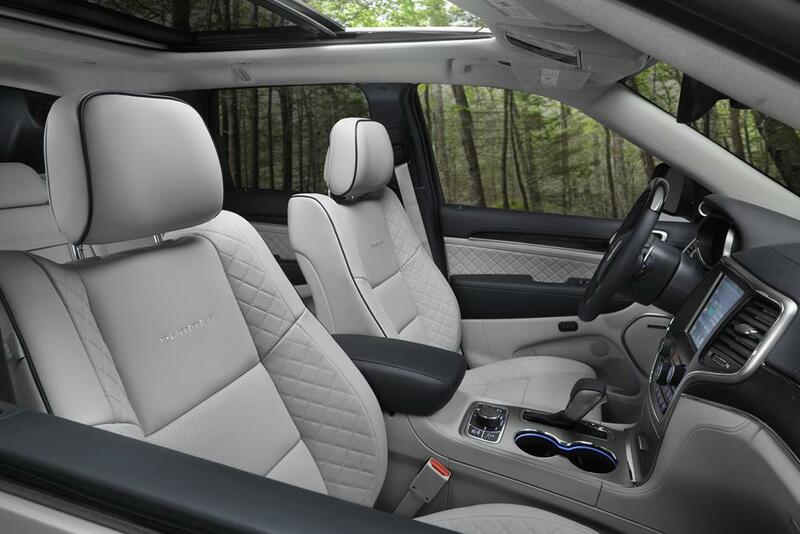 Interior quality is improved, especially on the top-of-the-line Summit trim. Here you get leather seats that are both heated and cooled. Interior room is good for five people. 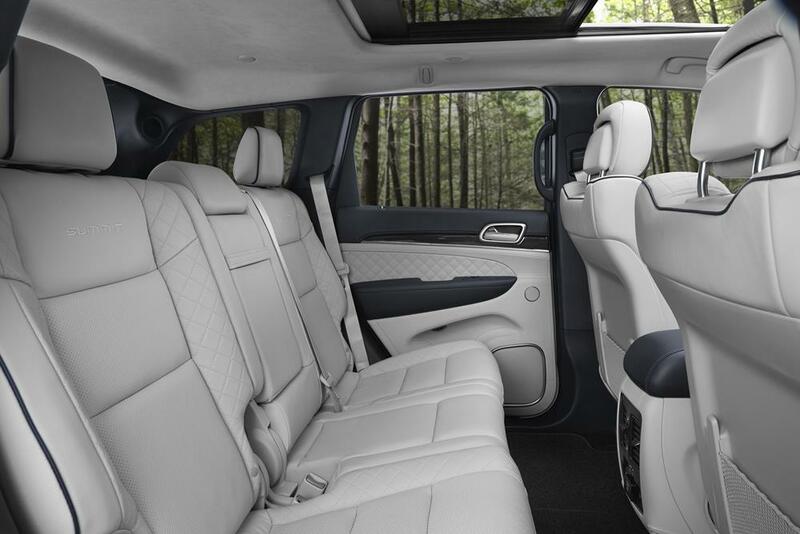 Three adults could sit in the back, and two adults would be ideally comfortable in the back without any leg or shoulder room concerns. There’s 68.3 cubic feet of cargo space in the Grand Cherokee. This is near the top of the segment. FCA has the best infotainment system in the business. It’s simple, clean and intuitive. The UConnect system is run through a 7-inch touchscreen. There’s a 19-speaker Harmon Kardon sound system. The infotainment system is easy to use, with smooth smart phone integration. In a world of frustrating infotainment systems this one is extremely user friendly. There are four trims of the Grand Cherokee. The SRT trim (which is technically the fifth trim) is essentially a different vehicle. The four standard trims are Laredo, Limited, Trailhawk and Summit. The top-of-the-line Summit has a steep price tag, when compared to the base price of the Laredo, which is under $35,000. My tester’s base price was $53,395. With options like additional off road features like a skid plate, 20-inch wheels, blacked out grille (which looks amazing) and premium leather, my tester had a final MSRP of $6,0,675. This puts the trimmed out Grand Cherokee into luxury SUV status. However, as improved as the interior is, and as nice as the performance is, it is not comparable to luxury SUV brands from Mercedes, Lexus or Cadillac. My tester, trimmed as such could compete with the conservative Acura MDX in terms of luxury. 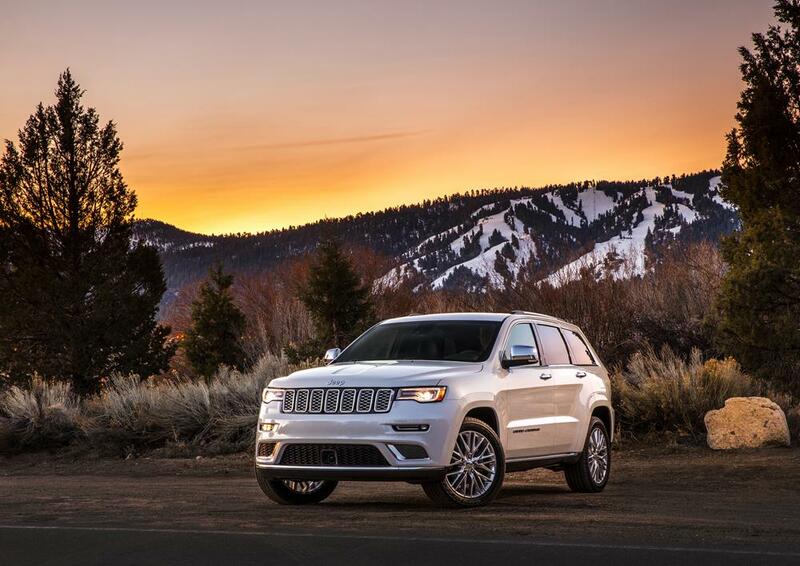 Where the Grand Cherokee would surpass is in its rugged nature. Fuel economy for the V6 Grand Cherokee is 18 mpg/city and 25 mpg/highway. Even with the smooth transmission, this is a disappointing fuel economy number. In a week’s worth of driving, I only averaged just over 20 mpg. 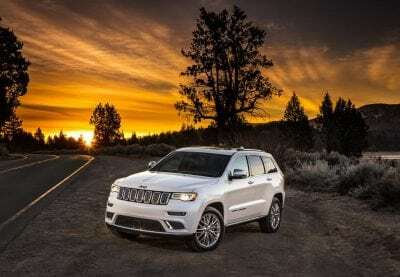 The turbocharged V6 has the best fuel economy offered on the Grand Cherokee, and would be the engine I’d recommend for all around economical savings and overall performance. The Grand Cherokee shows that Jeep is not just a one-trick pony. Sure, this SUV can get onto a muddy path and handle itself well, but it can also never venture off the asphalt and still be an excellent family vehicle or even a daily driver. With improvements to the performance and the interior, the Grand Cherokee continues to stay viable and offers a new kind of SUV for the American consumer.